The total area of mangroves in the WIO is estimated to be 1 million ha representing about 5% of the global mangrove coverage. 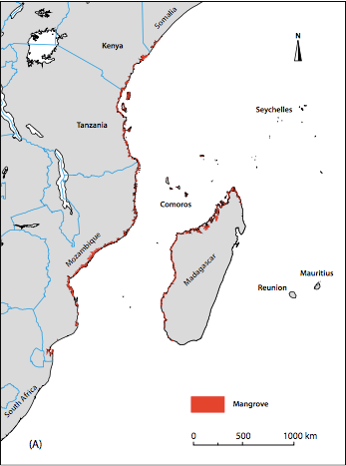 The best developed mangroves in the region are found in the deltas of Rufiji River (Tanzania), Tana River (Kenya), Zambezi and Limpopo Rivers (Mozambique) and along the west coast of Madagascar at Mahajanga, Nosy Be and Hahavavy. These mangroves are recognized for providing valuable ecosystem services, including wood products, fish habitat and storm buffering, which are critical to environmental health and human wellbeing.